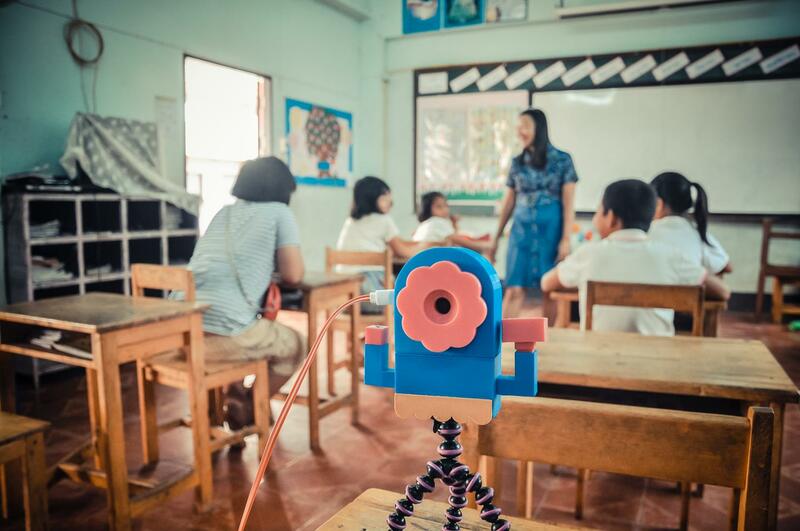 Researchers from the School of Engineering and Digital Arts (EDA) worked in primary schools in northern Thailand to test how a specially designed Internet of Educational Things (IoET) device could improve both active learning engagement and outcomes. To do this the researchers, led by Dr Jim Ang and PhD student Pruet Putjorn, developed a bespoke IoET platform called OBSY (Observation Learning System) that featured several components, such as a light reader and temperate monitor, which could then send data wirelessly to tablet computers the children had already been provided with by the Thai government. The OBSY device was designed to be as 'friendly' looking as possible, akin to a toy, to encourage curiosity in children as prior research had shown more typical-looking technological devices put children off and created learning anxieties. The device was then used as a key part of three different classroom experiments: studying the growth of mould in different conditions, learning about the different factors that influence the growth of mushrooms and seeing how much light can pass through different objects. Students using the OBSY tool were able to carry out these experiments in a variety of ways, such as using its camera to take photos or videos and compare them, monitoring changes in temperature in the objects being studied or measuring the amount of light passing through an object. They were then able to see this information – which had been sent directly from the OBSY – on graphs and other visual displays on their tablets, helping to improve their understanding of how different conditions led to different results. From this the researchers were able to show that the children using the OBSY tool had markedly higher learning engagement and crucially improved learning outcomes than that of a control class that did the same experiments but without access to the OBSY platform. Furthermore, the feedback also showed that gender, age and prior use of technology had no impact on learning outcomes, underlining its educational potential. In particular, the positive feedback by both males and females to the OBSY platform demonstrates that, despite previous studies suggesting boys are more receptive to technology-based learning, it is possible to design tools and platforms that can be used equally well by both sexes. The paper, entitled Investigating the use of sensor-based IoET to facilitate learning for children in rural Thailand, has been published in the journal PLOS ONE.